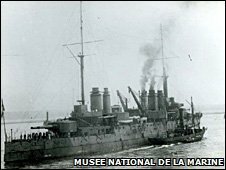 A French battleship sunk in 1917 by a German submarine has been discovered in remarkable condition on the floor of the Mediterranean Sea. The Danton, with many of its gun turrets still intact, is sitting upright in over 1,000m of water. It was found by the Fugro geosciences company during a survey for a gas pipeline between Algeria and Italy. The Danton, which sank with 296 sailors still onboard, lies 35km southwest of the island of Sardinia. Naval historians record that the Danton's Captain Delage stood on the bridge with his officers and made no attempt to leave the ship as it went down. The French government is now keen to see that the site is protected. "Its condition is extraordinary," said Rob Hawkins, project director with Fugro GeoConsulting Limited.